The Purcell Wilderness Conservancy Park is nearly pristine mountain landscape and the only intact ecosystem in southeastern BC. It embraces six large drainages flowing east to the Columbia River system, and three flowing west to Kootenay Lake. All emanate from the rugged and glaciated backbone of the spectacular Purcell Mountain Range of southeastern BC. The Purcell Mountains embrace high, glaciated mountains, beautiful alpine lakes, verdant wetlands, magnificent old growth forests and rushing rivers, providing habitat for an abundant variety of plant and animal communities. All of the ungulates of the Kootenay region, except bighorn sheep, are found within the Conservancy as well as many species of carnivore and smaller animals. Wilderness recreation opportunities include hunting, fishing, hiking, cultural sites, climbing, horseback riding (on the east side of the Park only) and wildlife viewing. A special feature in the park is the Dewar Creek Hot Springs. Visitors to the Purcells should be experienced wilderness travelers capable of interpreting topographical maps and route finding. A number of guide-outfitters offer hunting, hiking and wildlife viewing multi-day excursions. During a visit to British Columbia in 1908, Earl Grey, Canada’s Governor General from 1904 to 1911, crossed the Purcell Mountains from Invermere to Argenta on Kootenay Lake by a trail up Toby Creek, over a 2,256-metre pass, and down Hamill Creek. The trail Grey followed by horseback and foot was already well known by First Nations people, miners and cattleman. The Purcell Mountains wilderness so impressed Grey that he wrote to the then Premier of British Columbia, Richard McBride, urging that this magnificent scenic mountain area be set aside as a national park. Nothing came of Grey’s proposal, however, and for over half a century the trail and the mountains remained the preserve of a few trappers, outfitters, foresters, and prospectors. Guide Outfitting and trapping territories were established in the 1950’s within what is now the park and continue to operate today. In the mid 1960’s Rod and Gun Club members from Invermere began lobbying to protect the Purcells. With industrial logging coming to many valleys, local people together with other outdoor clubs and conservationists felt a sense of urgency to protect this spectacular area. The Purcell Wilderness Conservancy was created in 1974. 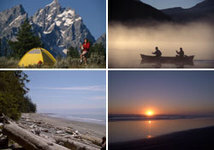 In 1995 an expanded Purcell Wilderness Conservancy became a British Columbia Class A Provincial Park. The Purcell Wilderness Conservancy Park is critical in maintaining the viability and biodiversity of the largest intact ecosystem in southeastern BC - the Purcell Mountains. This contiguous undisturbed wilderness is one of the first large scale wilderness areas in Canada to be set aside as a result of local citizen action. Guide-outfitters and residents have accessed the east side of the conservancy with pack trains for many years for sightseeing expeditions and to hunt a sustainable wildlife population. On the west side, cultural artifacts from the early mining period are still in place along the lower Hamill Creek. The park has very few supplies, public shelters, improved trails, bridges or equipment of any kind. All arrangements for supplies, rescue and transportation must be made beforehand. Lightning storms with hail and snow are common in summer. Crevasses: Only experienced climbers practiced in crevasse rescue and properly roped, should venture onto snowfields and glaciers. River crossings: Five river crossings use cable cars. Hikers will require gloves for pulling cable at these crossings on the lower Hamill Creek. Beware of Grizzlies: The Purcell Wilderness Conservancy is home to a healthy resident grizzly bear population. It is very important for visitor and bear safety, to recognize recent signs, maintain clean camps and remain alert while traveling. Please practice no trace camping. Boil your water: Giardiasis, commonly known as ‘Beaver Fever’ exists throughout the backcountry of British Columbia. Water should be boiled or filtered before drinking. Be extremely careful with fire: Primus-type stoves should be utilized for all cooking. Fishing: if you plan to fish, you will need a British Columbia angling license. Firearms: Firearms are prohibited except during a valid hunting season. Consult British Columbia Hunting Regulations for dates. Access to the east side of the Park is by gravel roads leading west from Highway 93/95 along Toby Creek, Findlay Creek, Skookumchuck Creek, St. Mary’s River and Dewar Creek. These roads are frequently used by industrial logging traffic - caution is advised. Distances vary from 35 to 75 km to the trailheads. West side trailheads at Hamill Creek and Fry Creek are accessed from Highway 31 by turning west at Meadow Creek and proceeding south along the east side of Kootenay Lake to Argenta or Johnson’s Landing. The Kootenay-Joe Road leads from near Johnson’s Landing to the height of land between the front range and the Conservancy. The Purcell Wilderness Conservancy Park is a non-mechanized area: access by vehicles of any kind including ATV’s, snowmobiles, bicycles and helicopters is prohibited and enforced.